At the time the whole concept of the Secret Wars (omnipotent force from another universe known as the Beyonder encourages multi-crossover story arc) seemed to place a blight over the whole Marvel range, with every major hero referencing him every other issue. Okay, the commercial success of the series may have led Marvel to doing crossovers again, with Atlantis Attacks as a nadir, but thirty years past the ubiquity of the Beyonder and it really doesn't seem all so bad. Sure, it's pulpy and trashy, but it's kind of fun for a series that writer (and Marvel editor-in-chief) Jim Shooter admits was devised in order to sell toys. Of the various parties involved, then Spider-Man had arguably the biggest change, gaining a new black and white costume that eventually turned out to be an alien symbiote that became his phenomenally popular foe, Venom. But for the FF changes were also apparent, with Ben - who found he could change to and from the Thing at will on the Beyonder's world - staying behind, leaving She-Hulk to take his place on the team. From July 1983-June 1986 The Thing had his own mini-series, which lasted for 36 issues. #10-#22 took place on the world, chronicling his exploits and his falling in love with a native, Tariana. But back to the Secret Wars, and while Ben is portrayed reasonably well, Reed less so, (Sue, pregnant at the time, was left on Earth) Johnny is written as a total jerk. Never before has he been so obnoxious, so moronic or so emotionally immature. 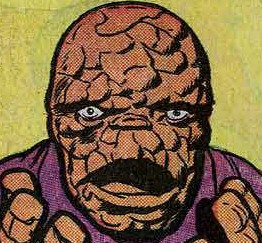 It doesn't end with Johnny; the Absorbing Man gets awful lines like "Doctor Doomwimp" and the Wasp is rendered as a blabbermouth airhead. Other, smaller problems come with the introduction of "Volcana", a new super-villain who is above size 10, consequently a normal-sized woman, but "fat" in the Marvel universe. Doctor Doom actually gets a very good part to play, being arguably the most dominant character of all, but in terms of overall quality then the artwork to this was scrappy. surprisingly so given that Mike Zeck went on to illustrate the superb Spider-Man story Kraven's Last Hunt. Not only that, but with Jim Shooter as writer, then his blending apochryphal lines like "It's no wonder that the name Mister Fantastic is reknowned for compassion as well as courage! You give added meaning to the word hero, Richards!" with horrifically bad exposition means that you'd be hard pushed to find a Marvel comic as badly-written as this in all their years of publishing, at least up to that point. Even more surprisingly, for such a childishly written and plotted series then it also has a worrying obsession with bodily mutilation and violence. 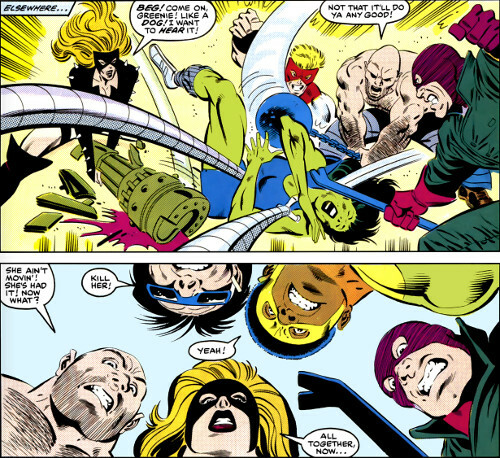 The idea of villains trying to kill heroes is usually skirted around in the comics, but moments like five villains (four of them male) beating She-Hulk into a coma and Doctor Octopus smashing her head against a rock is an odd choice for a series that was only launched in the first place to sell toys from Mattel.